Milan's famous gardens are dotted around the city providing a place to relax during the fair. and the perfect outdoor exhibition venue. Spring has arrived in Milan which just makes everything even more beautiful in this Renaissance city. The sky is blue and the colours vibrant, parks are full of people and art – Phillip K. Smith III’s installation for Cos is a standout, and historic buildings are freshly energised with layers of contemporary design. Milan Design Week is a moment when doors open to buildings not normally accessible to the public, so as well as the design offering, it is a chance to get up close and personal with the city’s more private architecture. At Casa Via Cesare Correnti, a classic 18th-century residential building with terraces and a traditional Milanese courtyard with Tuscan columns, Local Design presented the latest rendition of 'Local Milan'. Inside, soaring ceilings, painted stucco walls, slightly peeling and chalky in their finish (so sophisticatedly Italian), provided the perfect backdrop for the biggest collective showing of Australian design at the fair ever. At 'Local Milan', Adam Goodrum's 'Bloom' cabinet made in collaboration with Arthur Seigneur, the Nave chair by Tom Skeehan and Jonathan Zawada's Chair in the foreground. The SP01 Outdoor collection by Tom Fereday on show at 'Local Milan'. For Local Design founder and curator Emma Elizabeth, it is the group's third showing in Milan (more than twice the size of 2017) and the place hums with talent. Nicholas Fuller's voyage Screen and Jonathan Zawada's 1970s inspired Chair, Adam Goodrum's colour-packed 'Bloom' cabinet made in collaboration with marquetry artisan Arthur Seigneur, the quirky Nave chair by Tom Skeehan and the SP01 Outdoor range by Tom Fereday, are just a few of the highlights. In the Brera design district, London-based product designer Lee Broom has launched a new lighting collection titled ‘Observatory’. The softly lit interior unfolds in a series of rooms showing planetary inspired pieces – Eclipse, Orion, Aurora and Tidal – incorporating LED technology and Broom’s ability to create an immersive experience. Pieces are sculptural, beautifully made, and fill spaces horizontally and vertically, not unlike a jewellery piece wrapping the body. The collection is designed to build on too, so there is flexibility in personalising the way each light is clustered. The Orion light by Lee Broom is part of the show 'Observatory' during Milan Design Week. Although it is not the biennial Euroluce event in Milan this year, lighting features strongly across most collections. The ‘Reverse Room’ installation at the Foscarini Brera Space featuring ‘The Light Bulb Series’ by James Wines. At Foscarini, the ‘Reverse Room’ installation was presented at the Foscarini Brera Space and included ‘The Light Bulb Series’ by James Wines. Known for their interesting experimentations with light, Foscarini describes this show as a designer's art-house collection. The collection is based on reflection and includes limited and numbered editions by artist and architect James Wines. Light bulbs are melted, broken, inverted, turned black, and ‘invaded' by nature and shown in a slightly surreal, dark room, that is upside down and slanted and filled with monochrome furniture. Designed by James Wines and his daughter Suzan Wines, inside the space table lamps blink and hover from the ceiling and suspension lamps emerge from the floor. The 'Kartell Crossing Generation' exhibition at their Flagship store on Via Turata. This year Kartell presented multiple shows in multiple locations. The 'Kartell Crossing Generation' at the group's Flagship store on Via Turata is described by Kartell as "a long-term project about the brand’s approach that looks at various audiences". In this case youth and the impact of language to embrace different forms of artistic expression and communication. The accompanying installation was bright and fun and explored the collection with a sense of play. Kartell will also celebrate Achille Castiglioni's 100th Birthday with 'Achille, Pier Giacomo Castiglioni: Light and objects' in a balance between modernity and tradition at the Kartell Museo at Via della Industrie. We will visit this show and other Castiglioni events later in the week. 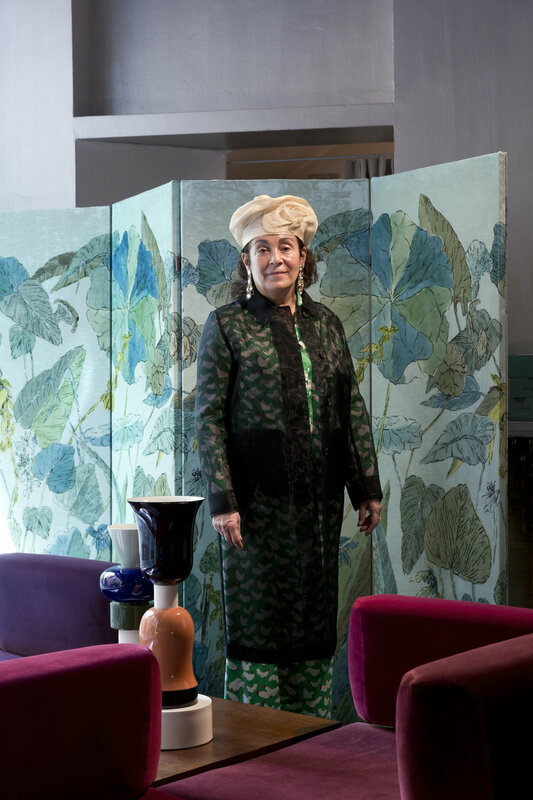 Nina Yashar, collector and founder of the Nilufar Gallery. Nina Yashar is to Milan’s design heritage what Franca Sozzani was to Italian fashion. 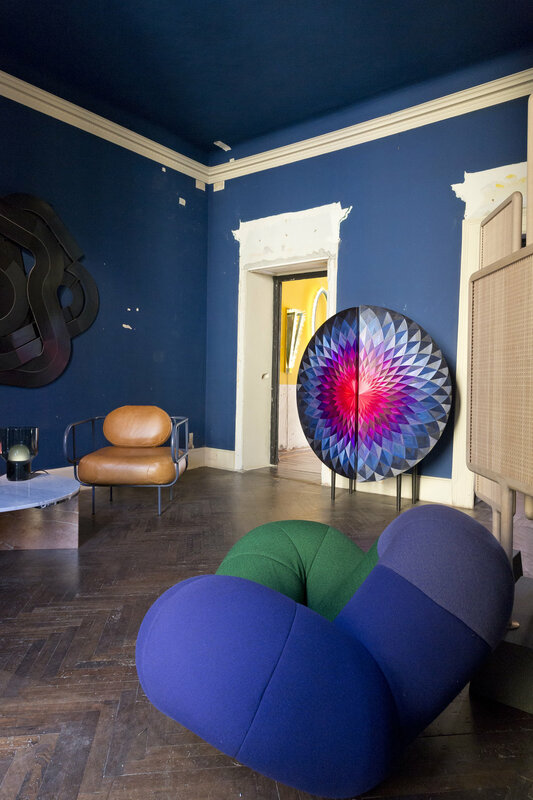 A design dealer with sophistication and a passion for history, her Nilufar Gallery in Via della Spiga is the go-to place, especially during Milan Design Week, with mid-century and contemporary mixing together in curatorial harmony. In 2013, Nina expanded her presence in Milan with Nilufar Depot, a huge warehouse space with over 3,000 pieces (gasp). During the fair this year the gallery is showing at both locations. In the classic rooms of their city hub, designer India Mahdavi created an exclusive 'club' dedicated to owner Nina Yashar. Here, ad-hoc furniture meets the gallery’s permanent collection. It’s beautiful and immersive and so Milan. While at Nilufar Depot, 'Lina Bo Bardi e Giancarlo Palanti – Studio d’Arte Palma 1948 – 1951’ is a collaboration with the Bardi Institute of São Paulo, Brazil, to investigate and celebrate the Modernist work of the two Italo-Brazilian designers. It is a project close to Nina's heart. She has been collecting the furniure of architect Bo Bardi since falling in love with her work on a trip to São Paulo and now has more than twenty pieces, alongside those of Giancarlo Palanti. It is a shining example of the important cross-cultural platform Milan Design Week presents to the world. .
more space will be back tomorrow with news from day three of Milan Design Week. All images by Space Furniture's photographer on the ground in Milan, Filippo Bamberghi.